RACER, Team Penske and Juan Pablo Montoya have teamed up for a question-and-answer session that will take place next week at Sonoma Raceway. 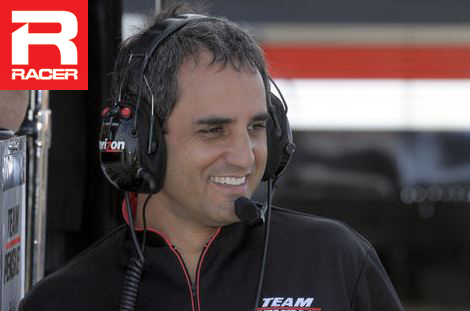 Montoya, Team Penske’s newest signing, brings success gained in Indy car, Formula 1 and NASCAR to the Roger Penske-owned program in 2014, and will take time out from his test Monday at the wine country road course to answer the five most compelling questions posted here via our comments section (CLICK HERE). The 38-year-old Colombian will field the five questions via web videos posted on RACER.com, so be sure to leave your submission today. MOORESVILLE, NC (December 13, 2013) – Despite the best efforts of Mother Nature, Juan Pablo Montoya completed his first two IndyCar Series oval track tests for Team Penske this week at both Phoenix International Raceway (PIR) and Auto Club Speedway (ACS). The team was originally scheduled to test at ACS on Monday, Dec. 9 and PIR on Wednesday, Dec. 11, but high winds in Fontana, Calif. forced an adjustment to the schedule as the Team Penske Dallara/Chevrolet instead ran at PIR on Tuesday and ACS on Thursday. Montoya’s testing program includes two fast ovals. By Dave Lewandowski Published: Dec 10, 2013 @indycar.com Juan Pablo Montoya completed Round 2 of his acclimation to the Chevrolet-powered No. 2 Team Penske car Dec. 10. This outing was on the one-mile Phoenix International Raceway oval. Back in Miami after an amazing @carrerestrellas in Medellin. Thanks to everybody that participated and helped.